Is Andre Ward the last great African-American boxer? The Genius was back at work Saturday night in Oakland, California. There, in ring center stood Andre Ward, gloves high, his eyes focused intently on his circling opponent, Alexander Brand, a tough, awkward, veteran light heavyweight from Colombia. Even though Brand was a 10,000-to-1 betting underdog against the marvelously talented Ward, the first four rounds had passed without fireworks. The match had been little more than a series of nervous feints, missed punches and clinches that left the partisan Ward crowd of nearly 9,000 at the Oracle Arena restless. What precious little scoring there had been was mostly by 32-year-old Ward. There was a stiff left jab to Brand’s body or a straight glancing right to the head, but they were single punches, not combinations. “The Son of God,” Ward’s nickname, had won every round on the official cards, but he had yet to mesmerize the crowd or solve his opponent’s troublesome style. Brand even flashed a smile at Ward, when the rushes by arguably the best pound-for-pound fighter in the world ended without consequence. 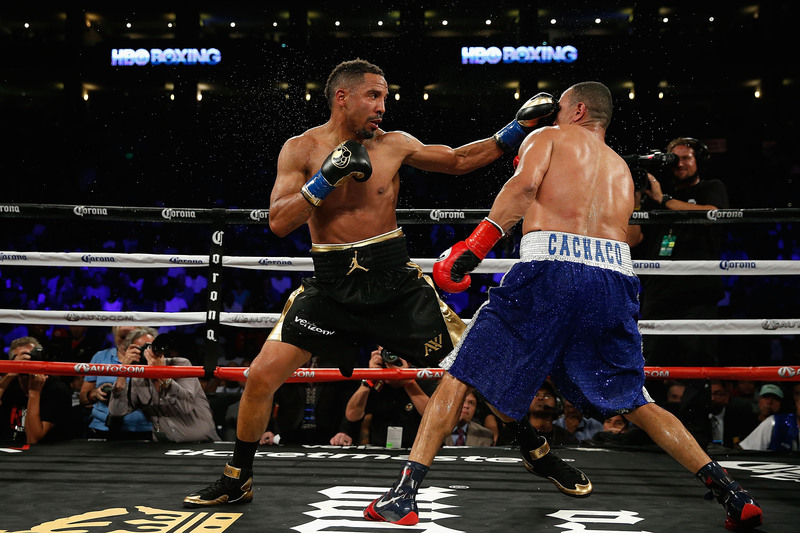 With less than a minute left in a tense, uneventful fifth round, Ward suddenly and smoothly shifted his stance from orthodox to southpaw. It was an unusual maneuver, one rarely used by even world-class fighters. Even the best boxers simply can’t fight as well by shifting from one side to another. It is a dangerous tactic that could make them more vulnerable to a left hook from an opponent, which has less distance to travel. Historically, only a handful of boxing’s true greats ever attempted to do that. Jersey Joe Walcott, Kid Gavilan or Marvelous Marvin Hagler were among the very few boxers blessed with the skill and the confidence to pull off this strategy successfully. Ward later said his wife and trainer had been urging him to use the tactic more often. Andre Ward (L) fights Alexander Brand in their WBO Intercontinental light heavyweight bout at Oracle Arena on Aug. 6 in Oakland, California. Yet, here was Ward shifting effortlessly, giving Brand one more thing to think about. It also gave Ward a different vantage point from which to see any potential openings in the Colombian’s defense. Brand made no visible reaction as Ward continued to stalk him, closing the distance between the fighters. The momentary suspense ended abruptly, as Ward pumped a sharp right jab into his opponent’s face, followed immediately by a left cross through Brand’s upraised gloves. The blows snapped Brand’s head back, spraying a halo of sweat into the air under the bright ring lights. Before the crowd or Brand could react, Ward threw another jolting one-two combination to the Colombian’s head. Seconds later, the bell sounded, ending the fifth round. The crowd roared. Clearly depressed, Brand walked to his corner, breathing heavily for the first time, a cut on his right eyelid. The bout would go the full 12 rounds, but it was effectively over once the Genius – patient and meticulous – had gone lefty and solved Brand’s style. The world will find out just how good Ward really is on Nov. 19, when he challenges undefeated light heavyweight champion Sergey “The Krusher” Kovalev in a megafight in Las Vegas. Kovalev, who was at ringside for Saturday’s bout and shook Ward’s hand in the ring afterward, is one of boxing’s most devastating punchers and a rival to Ward for the mythical title of best pound-for-pound boxer in the world. Andre Ward celebrates after beating Paul Smith in a cruiserweight boxing match in Oakland, California, on June 20, 2015. 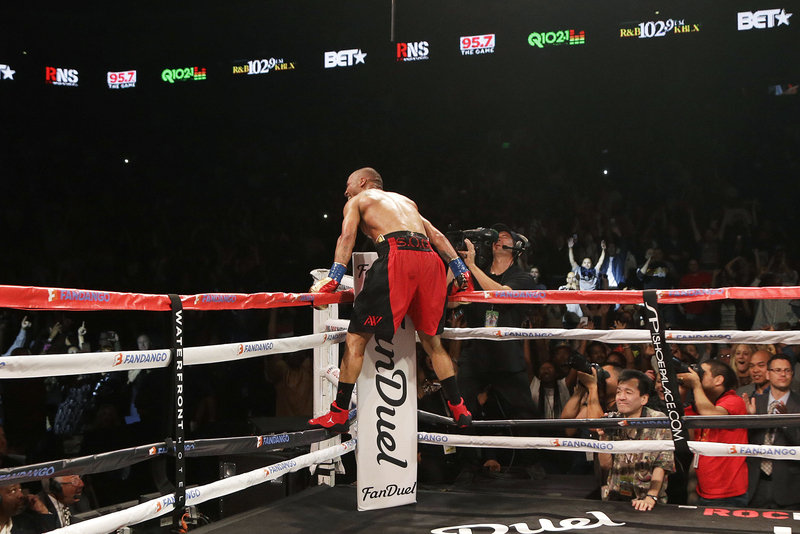 Ward won when Smith’s corner threw in the towel in the ninth round. The bout could be a coming-out party for the winner, giving the winner, and, perhaps even the loser, the kind of cultural crossover appeal that only the greatest sports stars achieve. But, perhaps more than that, the bout represents a generational crossroads between the ascendance of the Eastern European movement in boxing, as represented by Kovalev, and the fading fistic greatness of African-American fighters, personified by Ward. It’s been 31 years since Rocky IV hit the silver screen, but Ward-Kovalev shapes up as life-imitating art, real-life American boxers Apollo Creed or Rocky Balboa taking on Soviet slugger Ivan Drago. With the recent retirement of Floyd Mayweather Jr., Andre Ward could be the last great African-American fighter of his era. It is a reign of fistic dominance that stretches back more than a hundred years, since Jack Johnson won the heavyweight crown in 1908, and ran almost uninterrupted through the careers of Joe Louis, Sugar Ray Robinson, Archie Moore, Muhammad Ali, Sugar Ray Leonard, Marvelous Marvin Hagler to Mike Tyson. African-American fighters no longer rule the sport in either the professional and amateur ranks. Now top-rated African-American fighters, who dominated the rankings from the heavyweight to the lightweight divisions for decades, are few and far between. Besides Ward, there are fewer than a handful of African-American boxers – junior welterweight champion Terence Crawford, welterweight Errol Spence Jr. and Olympian Shakur Stevenson – who are seen by experienced boxing hands as having the potential to achieve greatness. Unlike most current American fighters, they are technically and fundamentally sound fighters, adept at defending and attacking a variety of different styles. American Deontay Wilder holds the World Boxing Council heavyweight title. He is undefeated in 37 fights, but in a division historically bereft of talent. Despite Wilder’s tremendous physical talent, he is fundamentally flawed. Wilder, who didn’t start boxing until he was 19, still remains an athlete who became a boxer. Ward, who first laced up the gloves as a 10-year-old, is a boxer who became an athlete. He is so fundamentally sound and so deeply steeped in boxing knowledge that he has an intuitive advantage over nearly all of his opponents. Ward has not lost a fight – any fight – in 18 years, against some of the best boxers in the sport. Ward was the last American to win an Olympic gold medal – a dozen years ago in Athens. Gone is the era of American Olympic gold medal excellence typified by Muhammad Ali, Sugar Ray Leonard and others. Why the sudden, precipitous drop in the fistic fortunes of African-American fighters? There are several theories. The word “globalization” seems odd when discussing the sport of boxing, despite its far-flung history. But the sport may rival soccer and basketball in worldwide appeal. The confusing alphabet soup of more than a half-dozen rival sanctioning bodies, each with its own title and divisional rankings, has diminished the title of champion. Ironically, it is the mythical ranking of the best boxer, pound-for-pound, that carries the most relevance. By whatever metric, it is clear that change is here. Only two Americans, Ward and Crawford, are ranked in The Ring magazine’s top 10 fighters pound-for-pound. 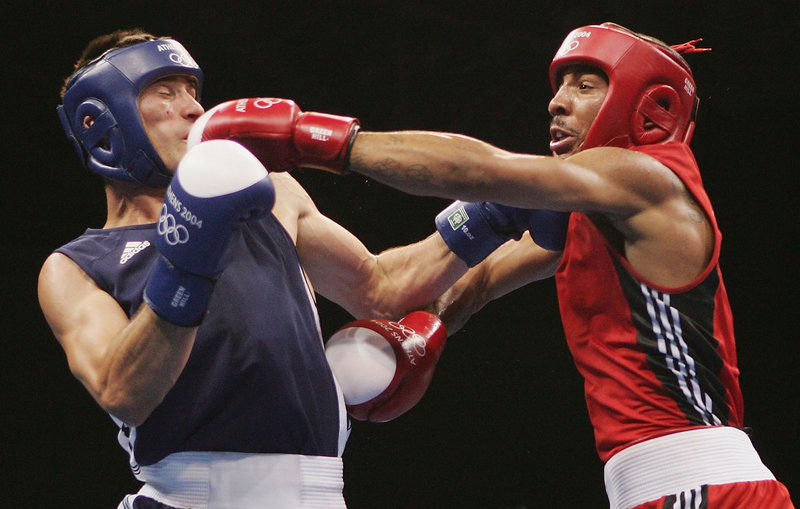 Andre Ward of the USA catches Magomed Aripgadjiev of Belarus (in blue) with a left during the men’s light heavyweight final bout on Aug. 29, 2004, during the Athens 2004 Summer Olympic Games at Peristeri Olympic Boxing Hall in Athens, Greece. Eastern European fighters and those from the former Soviet Union are also currently dominating the professional divisional rankings as much as African-American fighters did a generation ago. These include world middleweight champion Gennady Golovkin, of Kazakhstan, the Klitschko brothers, former heavyweight champions Wladimir and Vitali, of Ukraine, among others. Before the collapse of the Soviet Union, these talented boxers, who were heavily subsidized by the Kremlin, would have forever remained in the amateur ranks. The fall of the Iron Curtain paved the way for the Eastern European invasion of professional boxing. Ward certainly seems aware of the trend when speaking to reporters after the Brand bout. Ward may well defeat Kovalev, but the trends certainly seem to portend at least a generation of Eastern European dominance. Jim McNally, longtime boxing instructor at the U.S. Naval Academy in Annapolis, Maryland, said Eastern European boxing trainers are more numerous and better qualified than their American counterparts. He said Eastern European fighters are now dominant in the amateur ranks, especially against inexperienced American squads depleted by the departure of especially promising boxers who are turning professional at even younger ages than before. McNally, who started boxing in Joe Frazier’s old gym in North Philadelphia during its heyday in the early ’70s, added that many of boxing’s greatest trainers, such as Eddie Futch, Angelo Dundee, Emanuel Steward, George Benton and several others have died, taking decades of wisdom and training expertise with them to the grave. They are, of course, simply irreplaceable. McNally and others say that today’s generation of boxers is simply not prepared to work as hard on fundamentals, such as footwork and balance, as their predecessors in the gym did to perfect their craft. Amateur programs are declining and those athletes who are talented enough often turn professional to make money in careers that are already short. 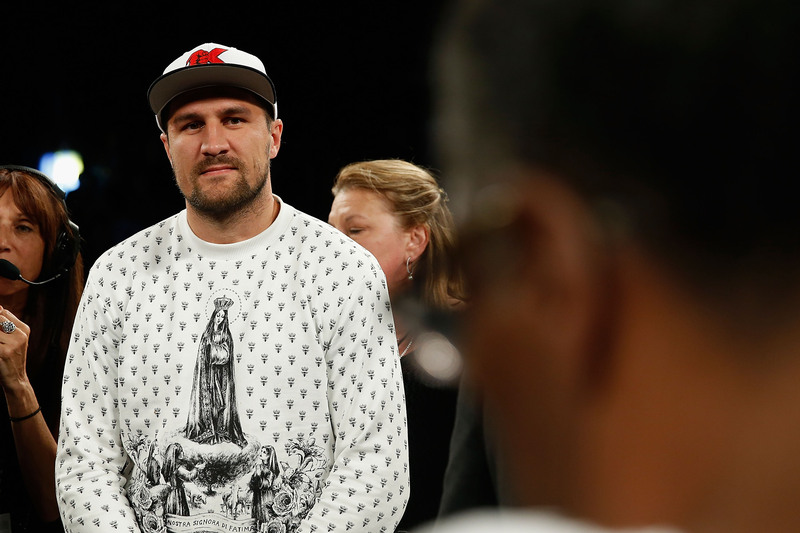 Sergey Kovalev looks on in the ring after the WBO Intercontinental light heavyweight bout between Andre Ward and Alexander Brand at Oracle Arena on Aug. 6 in Oakland, California. Others point to changes in the culture, before aspiring boxers even make it to the gym. James “Buddy” McGirt, a light welterweight and welterweight world champion in the ’80s and ’90s, attributes the decline to the scourge of drug abuse and the proliferation of guns in many major American cities such as New York, Philadelphia, Detroit and Chicago, which boasted dozens of gyms and held fight cards, both amateur and professional, on a weekly basis. McGirt, who grew up in Brentwood, New Jersey, said that before the epidemic of gun violence associated with the drug trade, the young boys and girls were taught how to put up their dukes to settle personal disputes. “We grew up, fought in the streets and we settled it,” said McGirt. “Today, a guy who has a gun, it makes you tough. That’s implanted in the youth today. When you have a gun, they may have a gun and blast you. Basketball, football and mixed martial arts and even soccer are more popular and less violent sports attracting youths. The great migrations in the 20th century of African-Americans from the Deep South to urban areas in the North ended in the 1960s, greatly shrinking the overall critical mass of possible boxers. There is not a generation of Joe Fraziers, Ezzard Charleses, Sonny Listons or Joe Louises leaving farms in South Carolina, Arkansas, Georgia or Alabama and boarding trains or buses to the North. Meanwhile, boxing in Russia and in countries of the former Warsaw Pact is increasingly seen as a way out of the urban poverty and the hardships around growing up there. McNally said he sees the hunger in the eyes of Eastern European amateurs that he rarely sees in their American counterparts. Perhaps it will take a transcendent performance by Ward against Kovalev to inspire a new generation of African-American boys and girls to enter the ring and achieve greatness, but the chances appear that a victory by the Genius will remain a singular achievement. Sunni Khalid, an award-winning journalist, lives in Oakland, California. The former foreign correspondent and amateur boxer is currently writing a book on Egypt.